When and where did winemaking begin? I starting getting engaged with this topic when reading the November 2017 press stories about new archaeological evidence for winemaking in Georgia 8,000 years ago. We were told that this pre-dates the winemaking remains previously accepted to be the oldest, which were discovered in northern Iran. That confused me because, for several years now, Georgians have been claiming an 8,000 year old unbroken winemaking tradition. And then, to make my confusion worse, I saw articles elsewhere saying that the remains of the oldest winery were in Armenia. It does not help that popular reporting occasionally fails to differentiate different between “BC” and “years ago”, as to most people a couple of millennia here and there does not seem to matter. In the face of all these claims and a smattering of misinformation, what seemed to be lacking was a recent overview of the evidence with no promotional agenda – which is what I aim to provide here. Firstly, as some say there is archaeological evidence for wine in China in 7,000 BC, let’s take a quick look at that claim. And dismiss it. What was found in China was evidence of a fermented drink. Some people have suggested the drink may have been made partially from grapes, but that is speculation, and seems very unlikely. Even if true, we would normally expect our wine to be made of grapes exclusively. While individual countries now lay claim to the oldest winemaking tradition, we must remember that modern-day boundaries did not of course apply back in Neolithic times. There was a largish region that included (to mix names from different eras) Northern Mesopotamia, Eastern Turkey, the Zagros mountains in Northern Iran, and the South Caucasus, in which there were many new developments: permanent human settlements, plant domestication for food, and crafts such as weaving, dying, stone working, woodwork and pottery. It was within this context that, not unsurprisingly perhaps, winemaking seems to have emerged. Archaeological evidence can currently only point to the existence of early winemaking activity in a few isolated instances, each one in a particular place and time. While important, that evidence sadly can say little about the general picture. However, there is also supporting evidence that links this region with the origin of viticulture and winemaking. Genetic diversity in a plant is taken to be an indicator that it has existed for a long time – simply because it has had more time to mutate – and the Eurasian wild grape shows its greatest genetic diversity in the Near Eastern uplands, suggesting that grape vines in their wild form originated there. Also, Western European grape varieties are closer genetically to the wild vine of Anatolia than they are to more local wild vines, meaning that they probably originated close to Anatolia as domesticated forms, and later spread west. This is also consistent with the current indigenous Georgian grape varieties being closely related genetically to those of Western Europe, though by itself that fact does not indicate any particular direction of travel. The oldest wine-related archaeological sites are in present-day Georgia, just 50km south of Tbilisi. They were two nearby villages, each around 1 ha in area – sites 2 and 3 on the above map – comprising circular mud huts of 1-5 m in diameter. Here sherds of fired-clay jars were found with residues that, when analysed, showed to be very likely to be of a grape product, and which were dated as 6,000-5,800 BC. The jars were up to 1 m high and 1 m in diameter, with a capacity of over 300 li. The jars had small unstable bases, so for stability could have been partly buried when used, but the decoration around the top of the jars suggested that they were not totally buried. Present day Georgian qvevris tend to be larger, and are totally buried, so these ancient jars are perhaps better seen as a forerunner of the Georgian qvevri rather than the first examples. In fact, no direct evidence of winemaking on those site has yet come to light, but pollen samples indicate that there were grapes growing nearby, and considering the wine culture known to exist in that region at later dates, it does not seem unreasonable to assume that wine was actually made in those villages. These are the same sites where for several years Georgians have, with little justification, been claiming an 8,000 year old history of winemaking. 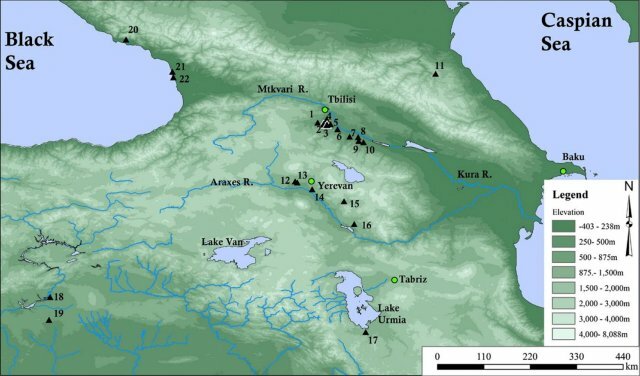 But it was a lot more recently that the convincing evidence mentioned above was obtained, and published in November 2017 the PNAS article Early Neolithic wine of Georgia in the South Caucasus. Unless credited elsewhere, this PNAS article is the source of pretty much all the information in this blog post, and the map is reproduced from that article, so if you want to chase up more detailed references that is where to go. Prior to November 2017, the earliest known winemaking site was in the of Northern Iran, site 17 on the map, just south of Lake Urmia. As on the Georgian sites, jars were found in a domestic mud hut with traces of the tartrates that indicated they had contained wine. These remains were dated to around 5,400-5000 BC. There were six partially-buried jars found in one hut, each with a capacity of around 9 li. This quantity was typical for a hut in the village and indicates winemaking on a sizable domestic scale, but we must go to the Areni-1 cave (site 15 on the map) of present-day Armenia for the earliest evidence of a proper winery. Unfortunately, because Armenia’s legitimate claim for the earliest known winery is sometimes made in isolation, this can easily give the impression that winemaking itself started here. While in actual fact the winery was dated to 4,000 BC – around two millennia later than the winemaking finds in Georgia. Nevertheless, the Areni-1 cave finds are significant and impressive. In addition to the tartrates, there were found grape-vine fragments, pips, and the red pigment malvidin. Also plaster pressing floors, arranged so the released grape juice would run into buried jars. To put these Armenian finds into a bit of perspective, they are roughly contemporary with early signs of winemaking in Northern Greece at Dikili Tash, yet still considerably earlier than anything in what is now Italy. So if anyone asks when and where winemaking began, the only honest answer is that we don’t know. However, there is a lot of circumstantial evidence that it was in or around the South Caucasus. And there is strong archaeological evidence for winemaking 8,000 years ago at a specific location in what is now Georgia, which is the oldest hard evidence we have at the moment. More interesting than chronological one-upmanship is perhaps the details of how wine was made in the Neolithic period, and how winemaking evolved into what we see today – but that is another story. This entry was posted in General and tagged archaeology, armenia, georgia, greece, iran, italy. Bookmark the permalink. 1 Response to When and where did winemaking begin? A fascinating subject which I look forward to reading more about as you explore the topic. Interestingly I went to Xian in the late 1980s to see the Terracotta Army. In those days an organised coach trip was the transport out there, and we stopped at a couple of other places. One was a museum which claimed to have evidence of “winemaking” from the period you mention for China. As you say, just what it was they were making we may never know.